In this topic you will learn how to export view event data and lead form data. Audience lead forms - These forms are built by selecting from a set of predefined fields in the Audience module. These forms save lead data in Video Cloud. For information on creating Audience lead forms, see Creating an Audience Lead Form. 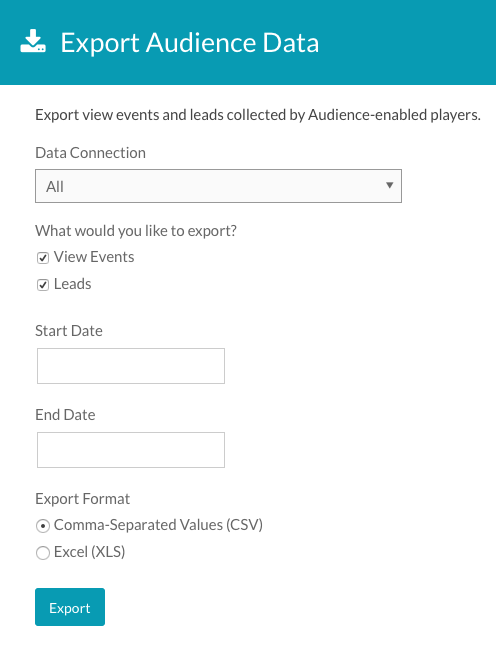 When exporting lead data from the Audience module, only data captured using Audience lead forms will be exported. Lead data from custom lead forms will be stored in your marketing automation software. Click Export Audience Data in the left navigation. Note: You must be an account administrator to access to the Export Data menu. Select a Data Connection to export data from. The Data Connection dropdown will list all the integrations that have been configured. Use the date picker to select a Start Date and End Date. Click Export to download the lead data. trackingId - Tracking ID passed as a URL parameter. For information on working with a tracking ID, see Creating Custom Integrations with the Audience Module. UTM fields - utmSource, utmMedium, utmCampaign, utmTerm and utmContent. For information on working with UTM fields see Working with UTM Fields in the Audience Module.